The book is a testament to the bonds between women who can share in each other’s triumphs and understand each other’s insecurities. 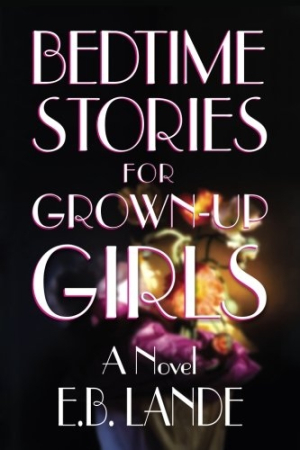 In E. B. Lande’s Bedtime Stories for Grown-up Girls, a remarkable friendship unfolds between two compelling women, framed by one pivotal moment where the stakes could be life or death. The story is off like a shot from the opening pages, with a love triangle, a funeral, an errant moose, and a drawn gun. Layers of mystery are shed as the novel progresses, until one shocking fact puts all that came before into stark relief. In the 1980s, Lillian and Cydney met through a mutual acquaintance and launched Baby Grand, a company specializing in products for parents of young children. In 2006, the present timeline in the novel, Lillian and Cydney are reunited at the funeral of a onetime “nemesis”—the wife of Cydney’s longtime boyfriend. When a car accident leaves them stranded on the side of the road, Lillian spins stories from their mutual past as the situation becomes increasingly desperate. There are elements of mystery/thriller that escalate the excitement of the plot, including stolen jewelry, bullying loan sharks, and a cheating senator. These elements, and the framing of the story as anecdotes from the past being recalled in the present, allow for fun speculation about where the story is going and how it’s going to get there. Clues are dropped, secrets are revealed, and the suspense is palpable. The title is a clever delineation of the book’s content, as the story is unfolding largely through short vignettes Lillian is telling Cydney to remind her of their shared past. Some stories are more successful than others. An extended history of Lillian’s family and their acquisition of the jewelry that plays a central role in the plot is somewhat digressive. The book is a testament to the bonds between women who can share in each other’s triumphs and understand each other’s insecurities, who look out for each other and raise each other up in a male-dominated business world. Their unwavering support for each other echoes through Lillian’s refrain to “never leave the ship,” and it is rendered poignantly without being overly sentimental.